The collective for lions is pride—so that one speaks of a pride of lions and a stand of trees, a gaggle of geese and a pod of whales. And is it, perhaps, a push of people? I have been trying to find the collective for cats and cannot come up with it. Perhaps contemplation would be the word—a contemplation of cats, for of all familiar creatures it seems to me that cats are in constant contemplation. But then again one hardly ever sees a crowd of cats, for they seem to prefer solitude except in the frenzy of the night and that may be the reason I cannot find a collective for them. Cats have been constantly in my life ever since some 20 years ago when my daughter wanted a kitten for Christmas. There are not many kittens available at Christmas time, but I found a black and white one for her which became the matriarch of a long line of cats of a variety of colors, for the original cat was adventurous in her affairs and her children and their children inherited the tendency. I am not myself fond of cats and I am not at all sure that they themselves approve of me. They endure me, I suppose. They tolerate me and are amused at my graceless, un-feline behavior. I once asked that original black-and-white white cat what she thought of me and the reply was chilling. She closed her eyes and passed her pink tongue over her lips as if savoring a meal. After that I was never quite at ease in a room alone with her. Her offspring were all cats of character. We kept one from each litter, gave the others away and had the mother altered and so we were able to control the cat population around the house. One of her line, the only one I was really fond of, became a famous sea cat, for I took her to Hawaii as a kitten on my boat. Alas, though weaned, she was really too young to leave her mother. She had not learned to cope with fleas and was soon crawling with them so that I had to give her a bath several times which was the equivalent of picking up handfuls of fishhooks and rubbing them with soap and then toweling them. But eventually the fleas were brought under control and Motley (that was her name) settled down to the voyage. In sailing through the tropical waters, flying fish and tiny squid fling themselves aboard at night and when the first arrived, wriggling in the cockpit, Motley reverted to her ancestors of millions of years before and became a sabre-toothed tiger. She was on the fish in a moment, all claws, teeth and savagery, killed it quickly and then, hissing if anyone approached, devoured the whole thing. She had soon discovered that the ocean was the source of this delicious largesse and would spend hours walking perilously along the gunwale, watching the rolling blue ocean and awaiting another handout. Cats, of course, are supposed to be afraid of water—but Motley had not been long enough with her mother to learn this fear. When we arrived at Lahaina (19 days out and the Genoa ripped three times) and had cleared health and customs inspection, we were warned that the cat must not be allowed ashore in keeping with the regulations for the control of rabies. It was useless to argue that Motley could not possibly be rabid, having been quarantined by being almost three weeks at sea. There was nothing in regulations to cover cats that had been yachting. So we would leave her whenever we rowed ashore. And Motley would jump into the water and swim behind the dinghy. She swam with great energy and delight. We would pick her out of the water and put her back on board or give her another boat to cat-sit until we returned. Eventually, Motley came to despise the land and in the heat of the afternoon would often jump overboard and go for a swim in the harbor. 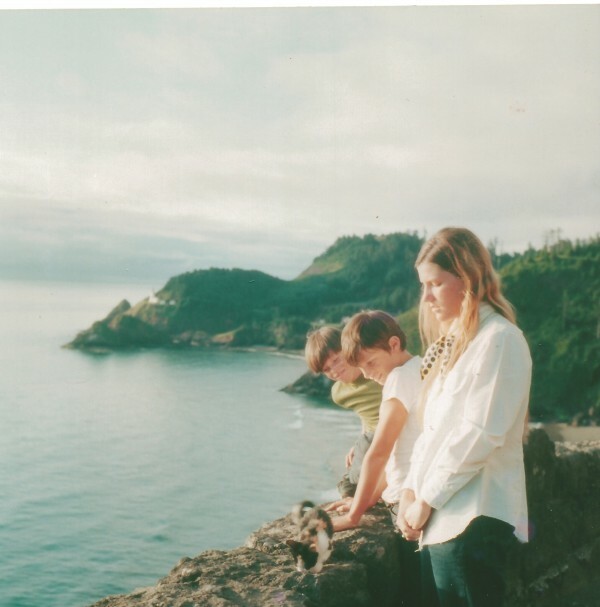 When I brought her home, invigorated by the sea voyage, she had a stupendous litter of kittens. EDITORIAL NOTE FROM LEONARD'S SON: Soon after the voyage, Motley was spayed, but the operation was botched. Leonard tried everything he could to save her but couldn't. It was the first time I saw my father cry. We always had cats after that. 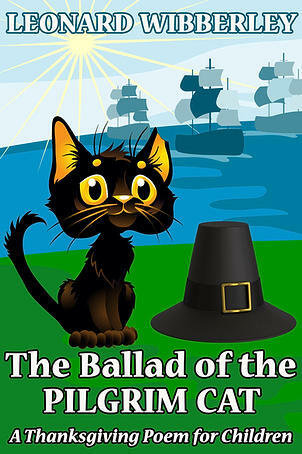 Motley was the inspiration for Leonard's Thanksgiving Poem for Children—The Ballad of the Pilgrim Cat, now only 99-cents on Kindle. Download the FREE 22-minute audiobook here.